A scientific paper written by Alert Project Consortium members, The University of Hertfordshire, has been published in the highly prestigious online journal Optics Express, the online voice of the Optical Society of America (OSA). The paper on ALERT has since been picked up by countless news agencies across the world. The publication by Optics Express of the University of Hertfrodshire's paper supports the Alert Consortium's claim that ALERT is the world's first real-time detector and monitor of deadly airborne asbestos fibres. Asbestos was once called a miracle material because of its toughness and fire-resistant properties. It was used as insulation, incorporated into cement and even woven into firemen’s protective clothing. Over time, however, scientists pinned the cause of lung cancers such as mesothelioma on asbestos fiber inhalation. Asbestos was banned in the many industrialized countries in the 1980s, but the threat lingers on in the ceilings, walls and floors of old buildings and homes. Now a team of researchers from the University of Hertfordshire in the U.K. has developed and tested the first portable, real-time airborne asbestos detector. They hope that the prototype, described in a paper published today in the Optical Society’s (OSA) open-access journal Optics Express, will be commercialized in the U.K. in the next few years, providing roofers, plumbers, electricians and other workers in commercial and residential buildings with an affordable way to quickly identify if they have inadvertently disturbed asbestos fibers into the air. 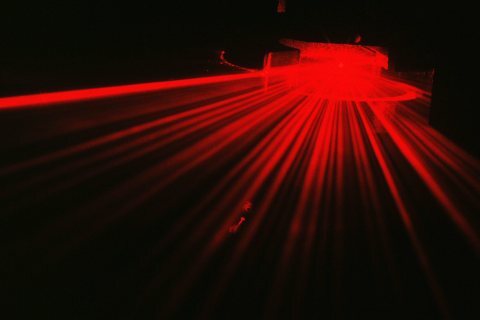 This image shows light scattering from a thin fiber particle illuminated by a laser beam. In this case the fiber is not asbestos. Light patterns such as these can be used to identify the shape and orientation of airborne particles. Credit: Paul Kaye, University of Hertfordshire, UK. Currently, the most common way to identify hazardous airborne asbestos at worksites is to filter the air, count the number of fibers that are caught, and later analyze the fibers with X-ray technology to determine if they are asbestos. The approach requires expensive lab work and hours of wait time. An alternative method to evaluate work site safety is to use a real-time fiber detector, but the current, commercially available detectors are unable to distinguish between asbestos and other less dangerous fibers such as mineral wool, gypsum and glass. The University of Hertfordshire team’s new detection method, in contrast, can identify asbestos on-site. It does so by employing a laser-based technique that takes advantage of a unique magnetic property of the mineral. When exposed to a magnetic field, asbestos fibers orient themselves to align with the field. The property is virtually unique among fibrous materials. “Asbestos has a complex crystalline structure containing several metals including silicon, magnesium and iron. It is thought that it is the iron atoms that give rise to the magnetic properties, but the exact mechanism is still somewhat unclear,” says Kaye. Kaye notes that his team wasn’t the first to try to exploit the magnetic effect to develop an asbestos detector. “Pioneering U.S.-based scientist Pedro Lilienfeld filed a patent on a related approach in 1988, but it seems it was not taken forward, possibly because of technical difficulties,” he says. The Hertfordshire team’s new detection method, developed under the European Commission FP7 project ‘ALERT’ (FP7-SME-2008-2), works by first shining a laser beam at a stream of airborne particles. When light bounces off the particles, it scatters to form unique, complex patterns. The pattern “is a bit like a thumbprint for the particle,” says Kaye, sometimes making it possible to identify a particle’s shape, size, structure, and orientation by looking at the scattered light. “We can use this technique of light scattering to detect single airborne fibers that are far too small to be seen with the naked eye,” he says. After identifying the fibers, the detector carries them in an airflow through a magnetic field, and uses light scattering again on the other side to tell if the fibers have aligned with the field. “If they have, they are highly likely to be asbestos,” Kaye says. The team has tested their detector in the lab and has worked with colleagues in the U.K. and Spain to develop prototypes that are now undergoing field trials at various locations where asbestos removal operations are underway. “Our colleagues estimate that it will take 12 to 18 months to get the first production units for sale, with a target price of perhaps 700-800 U.S. dollars,” Kaye says. As production increases after the initial product launch, Kaye hopes that costs may be cut even further, making the detectors even more affordable for an individual plumber, electrician or building renovator. “These tradespeople are the most frequently affected by asbestos-related diseases and most who get the diseases will die from them,” Kaye says. The team hopes that, over time, the new detector will help to reduce the 100,000 annual death toll that the World Health Organization attributes to occupational exposure to airborne asbestos.